As the iPhone 5 went on sale Friday, lines at retail stores were again subdued compared to previous product launches, as Apple's new reservation system prevented excitement from turning into potentially dangerous crowds. Reacting to concerns over relatively small lines at Apple's retail locations in China on Friday, Gene Munster of Piper Jaffray reminded investors that Apple's reservation system was designed to avoid crowds. It's the same scenario as a week ago, when the iPad mini debuted in China to few crowds at Apple's stores. That product was also launched with Apple's reservation-only system, which also helps to prevent scalpers from getting their hands on the company's latest devices. The system was instituted after the iPhone 4S launch in January of this year was disrupted by an unruly crowd in Beijing. The crowd prevented Apple from opening its store in Sanlitun, and the company decided to postpone the launch of the iPhone 4S in Beijing and Shanghai. A scuffle also occurred in mid-2011 for the launch of the iPad 2 and white iPhone 4, where customers shook a glass door and shattered it at the Sanlitun Apple Store. As of Monday, preorders for the iPhone 5 through carrier China Unicom were at more than 300,000 ahead of the product launch, suggesting that demand was strong. Munster noted Friday that China Unicom saw 200,000 preorders for the iPhone 4S, suggesting demand is even greater for Apple's latest model. Munster also cited increased distribution as another potential cause for small lines for Friday's launch. He believes that Apple has about two times as many points of sale for the iPhone 5 as it did when the iPhone 4S debuted. 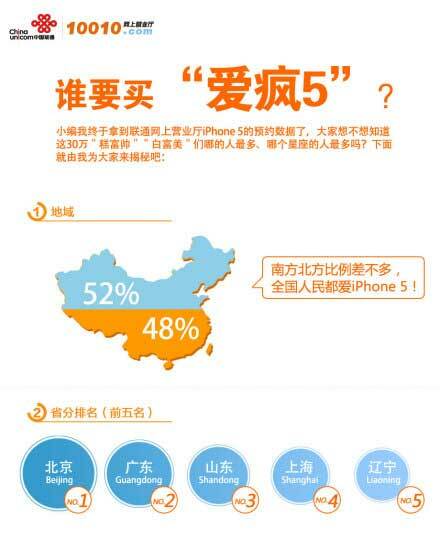 The iPhone 4S only launched on one carrier, while the iPhone 5 is available on two: China Telecom, in addition to China Unicom. Munster estimates that Apple will sell 45 million iPhones in the December quarter, with between 4 million and 5 million of those coming from China. Piper Jaffray has reiterated its "overweight" rating for AAPL stock, with a price target of $900.